Apache Pig is a high-level platform for which is used to create programs that run on the Hadoop. The Language of Pig is known as Pig Latin. Pig is written in Java and it was developed by Yahoo research and Apache software foundation. Its initial release happened on 11 September 2008. Preparing for a job interview in Pig. I am sure you want to know the most common Pig Interview Questions and answers that will help you crack the Pig Interview with ease. Q1.What is the difference between Map Reduce and Pig? Map Reduce is a compiled language and code efficiency of Map-reduce is high and Pig is a scripting language with less code efficiency. Q2.What do you mean by the bag in Pig? Collection of tuples is known as a bag in a pig. Q3.What are the complex data types in Pig? Map, Tuples, and Bag are the complex data types of Pig. Q4.What is flatten in Pig? When we want to remove the nesting from the data in tuple or bag then we use Flatten. Q5.Suppose we have a file name with abc.csv and having the attribute like id, name, year, rating, duration. How will you upload this file to a pig? Q6.What is the difference between PigLatin and HIVEQL? HIVEQL is a declarative language and PigLatin is a procedural mail. Let us move to the next Pig Interview Questions. Q7.What do you mean by an inner bag and outer bag in pig? The relation inside the bag is referred to the inner bag and the normal relationship is known as an Outer bag. Q8.What is the difference between Group and COGROUP? GROUP operator is used to grouping the data in a single relation and COGROUP is used for making the relation in GROUP and JOIN. Q9.What is the difference between COUNT and COUNT_STAR? COUNT function doesn’t work with a NULL value when we are counting an element in a bag but COUNT_STAR will consider the NULL value. Q10. What are the diagnostic operators available in Apache Pig? Dump Operator, Describe Operator, Explain Operator, Illustrate operator. Q11.What do you mean by UNION and SPLIT operator? By using a UNION operator we can merge the contents of two or more relations and a SPILT operator is used to divide the single relation into two or more relations. Q12.How to get the top 10 tuples from the relation R? By using the TOP () function. Q13.What are the similarities between Pig and Hive? Pig use PigLatin and Hive use HiveQL both converts the commands into MapReduce jobs. Q14.what are the different types of UDF’s functions of JAVA which are supported by Apache Pig? Algebraic, Eval, Filter functions are the types of UDF functions. Q15.You have a file movies.txt in the HDFS directory with 1000 records. You want to see only the first 10 records from the movies.txt file. How will you do this? Let us now have a look at the advanced Pig Interview Questions. Q16.How do users interact with Hadoop in Pig? Q17.Is Pig support multi-line commands? Q18.What are all stats classes in a pigstats package? The function which is not built in operator but can programmatically create a function to bring up the functionality. Q20.Explain is the case sensitivity in Pig Latin? The functions and names of relations are cases sensitive in Pig Latin but a name or keyword and parameter are case insensitive. Q21.What is Grunt in Pig? Grunt is a command terminal which is an interactive shell where we give the command of Pig. Q22.What is the requirement of MapReduce in Pig programming? MapReduce is an execution engine. Pig engine provides the execution environment to run the pig programs. It converts the pig operations into MapReduce jobs. Q24.What are the execution modes of Pig? Local Mode: Pig operation will be executed in single JVM. MapReduce Mode: Execution will be done of the Hadoop cluster. Q25.What are the different Eval functions available in pig? AVG, CONCAT, MAX, MIN, SM, SIZE, COUNT are different EVAL pig functions. Q26.What do you mean by LOAD and STORE in Pig? These are the operator for Loading and storing the data in hdfs. Q27.Which Math function available in Pig? ABS, ACOS, LOG, ROUND, CBRT, SORT are the math functions available in Pig. Q28.What did the distinct keyword do in Pig? Q29.What do you mean by primitive Data type in Pig? Int, Long, Float, Double, Char array, Byte array are the primitive data types in Pig. Q30.What do you mean by a tuple in Pig? An ordered set of field of a data is called Tuple. If you are preparing for the Hadoop related jobs then You must prepare the Pig for that because this topic will play the major role to secure good remarks in the interview. 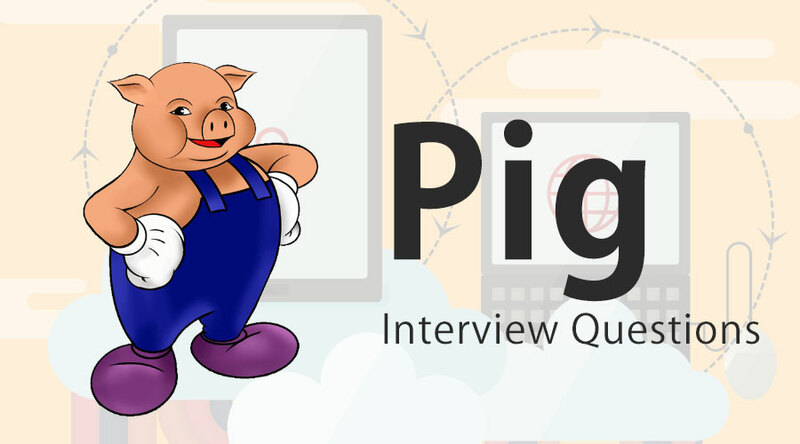 The Pig Interview Questions which are shared above will help you to prepare the basics and theoretically of the Pig but you must have the hands on the pig. It will help you to build up the confidence and advanced knowledge.